Tablet sales less than 10 percent of all devices in 2014. 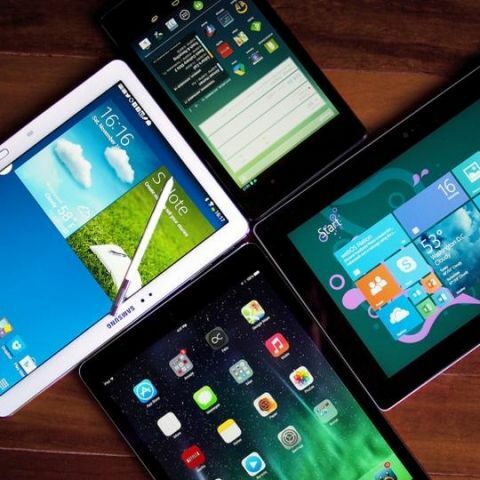 Global Tablet sales are showing a slow down in growth in 2014 as people turn to hybrids and two-in-one smart devices, according to research firm Gartner. Gartner predicts that worldwide tablet sales will touch 229 million units this year, which is just an 11 per cent growth over 2013 and represents 9.5 per cent of device sales in 2014. Tablet sales grew 55 per cent in 2013. Global shipments of smart devices including PCs, mobiles and tablets are expected to reach 2.4 billion units in 2014 a 3.2 per cent increase from 2013. According to the report Apple's new iPad lineup and Google's new Nexus tablet will help drive up tablet sales. "Some tablet users are not replacing a tablet with a tablet, they are favoring hybrid or two-in-one devices, increasing its share of the ultra mobile premium market to 22 per cent in 2014, and 32 per cent by 2018," Gartner Research Director Ramjet Catwalk said. "The device market continues to evolve, with the relationship between traditional PCs, different form factor ultra mobiles (clamshells, hybrids and tablets) and mobile phones becoming increasingly complex," Catwalk said. Gartner reports that mobile phone segment will continue to grow in 2014 due to strong sales of lower-end smartphone. Basic and mid range smartphone are projected to grow 52 per cent in 2014. Driven by low cost Android devices, mobile shipments are expected to reach over one billion in emerging markets in 2015. Android remains the largest OS with 313 million unit sales, Apple's iOS and Mac operating systems are second with 167 million unit sales and Microsoft Windows third with 141 million unit sales expected in 2014.
which smartphone of 2014 is best in user interface?